In a single year, he destroyed or routed five armies, each one stronger than his own. With his diplomas in his pocket, the young Captain Bonaparte dreamed of conquests and glory. Political events in France helped him to achieve those ambitions. He arrived at Toulon on September 16. The situation was desperate, with nothing being accomplished. He wanted to take charge of the situation. He tried to impose his plan on the leaders, but at first failed. Eventually, he convinced the commissioners of the Convention and, with their support, he prevailed. The proud General Dugommier, who had replaced de Carteaux, recognized the intellectual and strategic brilliance of his gunner and gave him carte blanche. Napoléon directed operations with a masterful hand, and the city fell on December 19. The commissioners praised him to the skies, and on December 27 he was acclaimed as a hero in Paris. He returned to the city as a brigadier general, having risen three ranks in four months. He would later say of that time, “Yes, follow me, I am the god of the day...” Among the commissioners was Augustin Robespierre, who had become in some fashion his mentor. This brother of the terrible Maximilien informed the Convention of the transcendent merit of the young general, and had him named commander of the Army of Italy. Napoléon propounded a plan that would allow him to overcome, step by step, the Austro-Piedmontese lines that threatened Marseilles. Yet, this plan came tonothing because he was arrested after the fall of Robespierre. Napoléon knew that he could die on the scaffold. During his imprisonment, he finished his detailed plan of attack in Italy, with supporting maps. Eight months later he was freed, although totally in disgrace. Named to command an infantry brigade in the Vendée, he refused and lived in Paris in a precarious situation. (As was the custom during the Terror, all the financial resources of the condemned had become the property of the state.) Not without difficulty, he managed to have himself admitted in the offices of the general staff. The Convention, overlooking his supposed past with Robespierre, named him second in command of the Army of the Interior and then, with the rank of general of division (major general), the commander of troops in Paris. Paul-Francois Barras, one of the Directors of the government, supported Bonaparte. Although Barras was corrupt and power hungry, he always attempted to identify the best officers to direct the French armies. During the night of 12 to 13 Vendemiaire, Year IV (October 4-5, 1795), Napoléon’s destiny once again rebounded. The royalist sections encouraged Paris to rise up and threaten the Directory. Barras was charged with repressing this uprising, a distasteful duty that was delegated to disgraced Jacobin officers like Bonaparte. The young general was given command of the artillery. Using a short barrage before Saint Roch, he dispersed the frightened survivors easily. The determined man who had captured Toulon appeared again, willing to do whatever was necessary. 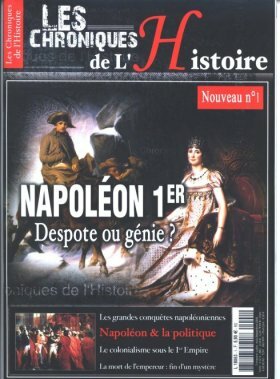 . . Napoléon appeared as the savior of the government. As a reward, on March 2, 1796, Lazare Carnot designated Bonaparte as commander in chief of the Army of Italy, at the time a defeated, disorganized, and penniless force. On 4 Germinal, Napoléon was on the pavement of Nice, with the greatness and wealth of Italy in his view. In addition to two large enemy armies, the Austrian and the Piedmontese, Napoléon had two other problems: on the one hand, he had to deal with the contempt and jealousy of older and more experienced lieutenants, while on the other the soldiers of his army knew nothing of the words “discipline” and “obedience.” Yet, the young Corsican overcame all these challenges. In a single year, he routed or destroyed five armies, each one stronger than his own. This included the Piedmontese army at Mondovi (April 12, 15, and 22, 1796) and four Austrian armies: that of Beaulieu at Cairo Montenotte, Millesimo, Degu and the bridge of Lodi (May 10), that of Wurmser at Castiglione (August 5), Roveredo, and Bassano, that of Alvinzi at Arcole (November 17), at Rivoli, and before Mantua (January 14 and 15, 1797), which surrendered Wurmser, and finally that of Archduke Charles, whom he pursued into Germany on the road to Vienna until Leoben, where an armistice was signed on April 29, 1797. The King of Sardinia, the Pope, the dukes of Parma, Moderna, and Tuscany had already signed or sued for peace. Yet, the Austrians, determined to expel him from their Italian possessions, marched in his direction with additional reinforcements. Bonaparte defeated them at Lodi, at Castiglione, and at Borghetto. The battle of Arcole, which lasted three days, opened the road to Venice, while that of Rivoli opened the road to Vienna. Horror-stricken, the Austrian Empire yielded to him. Napoléon was the master of Italy. Mantua fell after six months of siege; Rome allowed the conqueror to enter without battle. The Austrian Emperor asked for peace, and by the treaty of Campo-Formio (October 17, 1797), he ceded the provinces of Venice, the Austrian low countries with the entire left bank of the Rhine, and Milan, which became part of the Cisalpine Republic. Such prodigious success excited public enthusiasm for the young general. Europe turned its eyes towards this victorious young general, who soon entered Milan. In France, his popularity grew to the point that the Directors unwillingly submitted to it. The French population honored his glory by poems and songs, and everywhere the child of the Revolution won praise. The street on which he lived was renamed the Rue de la Victoire. The Directory named him commander-in-chief of the armies of France. Still disapproving of him, the Directory attempted to send him away. Fearing that he would be compromised by its intrigues (he had not forgotten his arrest in 1794), Bonaparte agreed to lead an expedition to the East that would cut the British route to the Indies, thereby weakening the only enemy that had not made peace. He sailed with a good army of 35,000 men, accompanied by several hundred scientists, towards the land of the Pharaohs. The famous expedition to Egypt could begin. He seized Malta from the knights of that island, who surrendered it unconditionally. He finally disembarked with his troops at Alexandria on July 2, 1798.